Jonathan Hope is quickly gaining a reputation at home and abroad as one of the most dynamic young organists of his generation. Educated at George Abbot School in his hometown of Guildford, he studied initially with Stephen Lacey, John Belcher and David Sanger, and then at the Royal College of Music, London with Margaret Phillips and Sophie-Véronique Cauchefer-Choplin. 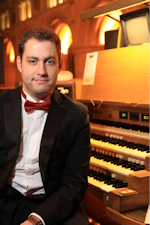 Jonathan became Assistant Director of Music at Gloucester Cathedral in March 2014, where he is the principal organist for the cathedral services, accompanist to the Gloucester Choral Society, Musical Director of the Saint Cecilia Singers and Accompanist to the Gloucester Three Choirs Festival Chorus. David Briggs is an internationally renowned organist who has built a worldwide reputation as an innovative musician and dazzling performer. Increasingly sought after for his orchestral transcriptions and improvisation, his performances are applauded for their musicality, virtuosity and ability to excite and engage audiences of all ages. He studied organ with Jean Langlais in Paris. The first British winner of the Tournemire Prize at the St Albans International Improvisation Competition, he also won the first prize in the International Improvisation Competition at Paisley. At the age of 17 he obtained his FRCO diploma, winning the Silver Medal of the Worshipful Company of Musicians. David is also Organist Emeritus of Gloucester Cathedral and is increasingly in demand as a composer. With an extensive repertoire spanning five centuries, David is also frequently asked to perform improvisation to silent films such as Phantom of the Opera, Nosferatu, Jeanne d'Arc and Fritz Lang's Metropolis. 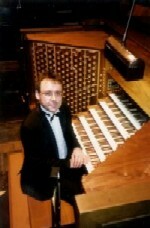 His annual silent film performance in Nurnberg's Sebaldplatz has become a highlight of International Organ Week. Professor Ian Tracey is one of Britain's best known and most widely respected musicians, having been organist at the monumental Anglican Cathedral in his home town of Liverpool for over 30 years. His performances there on the famous 'Willis' organ - the largest in the UK - have thrilled the instrument's thousands of fans around the world and met with praise from the critics. 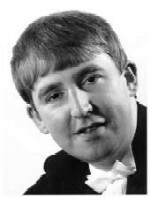 He holds several other official positions and combines them with a busy freelance career as a recitalist and conductor. Our audiences never tire of Ian's fantastic musicianship and playing style - not forgetting his amusing stories - and we are delighted to welcome him back to GMC in 2017 for his thirteenth visit! As a soloist Crispian's purity of tone and artistic subtlety have received widespread critical acclaim for more than four decades. On 10th October 2015 the BBC's CD Review concluded that, of all the available recordings of Haydn's famous Trumpet Concerto worldwide, his is 'the one to have'. 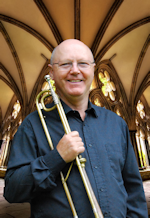 Together with GMC's famous trumpet stop, Crispian and Ian are sure to produce an amazing sound!